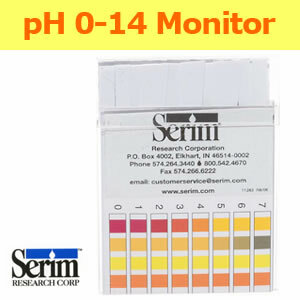 Serim® pH 0 -14 Test Strips give a semi-quantitative measurement of the acidity or concentration of hydrogen ion H+ present in an aqueous solution. The pH of the water affects the efficacy of carbon in removing chlorine or chloramine. Carbon filtration and reverse osmosis devices will not work as effectively at a pH of >8.5. 1. Monitoring Your Dialysis Water Treatment System, Northwest Renal Network, Seattle, Washington, June, 2005; www.nwrenalnetwork.org. 2. AAMI Standards and Recommended Practices, Dialysis, 2008 Edition, RD62 - Water treatment equipment for hemodialysis applications, Association for the Advancement of Medical Instrumentation. Arlington, Virginia. Serim® pH 0 -14 Test Strips give a semi-quantitative measurement of the acidity or concentration of hydrogen ion H+ present in anaqueous solution. WHY should I use this roduct? These characteristics prevent chlorine and chloramines from reaching adsorption or reaction sites on the carbon granules. To assure that the acid is fed in at the appropriate rate, pH must be monitored from a sample port just downstream from the acid feed pump. Review applicable regulations and manufacturers recommendations to determine appropriate testing requirements. Sample Collect water sample in a clean container. Test Strip Technique Completely immerse all indicator pads into water sample for 1 second. Store containers of Serim pH 0-14 Test Strips at temperatures between 15°- 30°C (59°- 86°F). 1. Monitoring Your Dialysis Water Treatment System, Northwest Renal Network, Seattle, Washington, June, 2005; www.nwrenalnetwork.org. 2. AAMI Standards and Recommended Practices, Dialysis, 2008 Edition, RD62 - Water treatment equipment for hemodialysis applications, Association for the Advancement of Medical Instrumentation. Arlington, Virginia.